The Chocolate War by Robert Cormier was originally published in 1974, yet it remains a timeless an unflinching portrait of corruption and cruelty. All the events in the books could have happened yesterday. Well, maybe not the hippie kid but then again maybe yes. Jerry Renault has a poster in his locker: Do I dare disturb the universe? Jerry decides to disturb the universe by refusing to sell chocolate in the annual Trinity school fund-raiser. While this may seem like no big deal, he is the 1st to ever refuse to sell the chocolates and it quickly divides the school. I realize that this sounds like the stupidest book in the world–why would anyone care about reading about fund-raising? But this book isn’t about a chocolate sale, it’s about peer pressure, conformity, and the difference that one individual can make in any given situation. 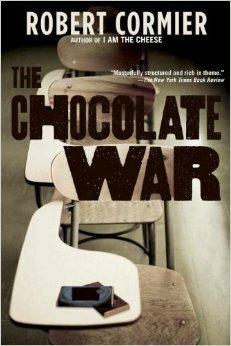 The Chocolate War is gritty take on high school. There are no good guys, no heroes. In a world full of scheming bastards, it was hard to root for anyone, let alone like anyone. I am definitely glad that I listened to this on CD because I am not sure I would have been able to read it. This entry was posted in Young Adult and tagged Robert Cormier, The Chocolate War. Bookmark the permalink.